Optical fiber cables: Optical fibers are often used for data transmission, control and communications. They are widely used in fiber-optic communication, which permits transmission over longer distances and at higher data rates than other forms of communications. Coaxial cables: An electrical cable consisting of an inner conductor or several uninsulated conductors tightly twisted together. Cable can be used for remote control, signaling, security systems, communications, intercom/P.A. systems and sound/audio etc. 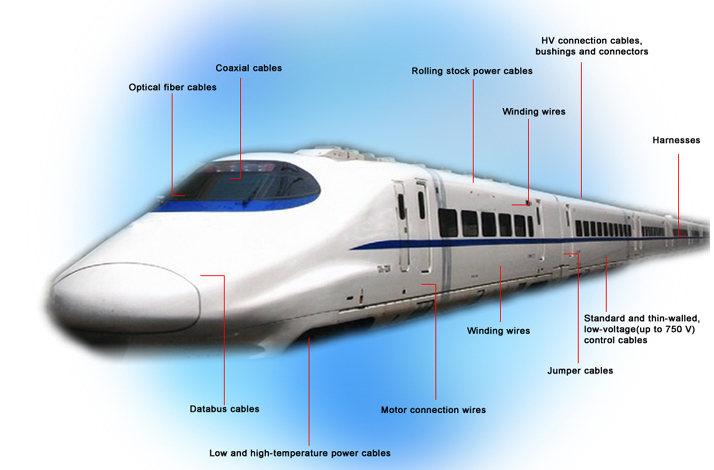 Rolling stock power cables: Wide range of flexible, Class 5, tinned copper single and multi-core rubber cables. It combines flame retardant, non-flame propagating and improved fire performance requirement. Winding wire: Copper conductors insulated with polyamide foil (temperature class 240), or impregnated glass fiber yarn/glass polyesterblended yarn (temperature class 155 to 200), and enameled (temperature class 180 to 240). HV connection cables, bushing and connectors: Flexible high-voltage cables (pre-mounted, pre-tested set, with bushings and connectors). Standard and thin-walled, low-voltage control cables: A type of control cable, provide energy and low frequency control for communications, public address, lighting. Databus cables: Power limited circuit, remote control, signaling, security systems and communications. Features are controlled characteristic impedance, low attenuation, high immunity to electromagnetic noise and interference. Motor connection wires: Flexible, high voltage cables with copper or aluminium conductors are the most widely used for high-voltage machines, such as transformers, motors and generators. Jumper cables: Cables between the locomotive, railroad cars and the cab car or driving van trailer on push-pull trains for multiple-unit train control and the transmission of lower voltage electricity. It transmits data and energy under a moving and open environment.